We love receiving recipes containing Conservas Serrats products which are not used as commonly as our anchovies or bonito. On this occasion, the original pasta salad with tomato which Silvia has sent our way is dressed with Conservas Serrats sea urchin caviar. 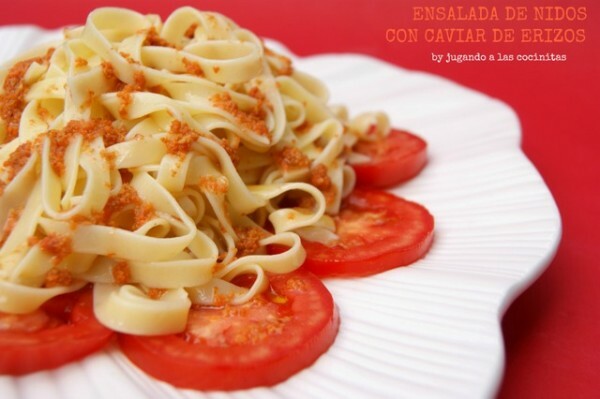 Silvia works with us, sending us fantastic recipes which leave us open-mouthed, and she continues to surprise us even though we keep regularly updated with her blog “Jugando a las cocinitas”, which is bursting with simple and delicious recipes. Well, folks, this salad has left us similarly gobsmacked, and we won’t rest until we have a plate of it sitting in front of us! If we want to really play things by the book, stick to the following ratio: three parts olive oil for one part vinegar, even though Silvia informs us that she personally uses a tad more vinegar. Feel free to experiment with this until you achieve the ideal result! Now place the pasta nests on top of the tomato, dress it in caviar vinaigrette, and you’re ready to tuck in!